I’ve been meaning to write more frequent book reports, but then I got that new job and life sort of takes over. Recently, I received a review copy of a book that was written by an acquaintance of mine, and to be honest, I wasn’t sure how much I was going to get out of it. It’s called The Recovering Spender: How to Live a Happy, Fulfilled, Debt-Free Life, written by Lauren Greutman. I already live a happy, fulfilled, debt-free life. But I have read a lot from her, and she’s a smart woman. We have similar views on many things, and we’re both moms. So I signed up to be part of her book launch, which included receiving a copy of her book. It arrived, and I put it aside. “I’ll get to it when I have a chance.” But then I woke up early a couple of days after it came, and I picked it up. She makes a pretty powerful statement in her Introduction. If you aren’t willing to do the hard work, you aren’t going to see the same results that Lauren had. If you aren’t willing to do the hard work, you shouldn’t buy the book. Wait until you’re ready to do the work. She starts off the first chapter talking about her “Spending Addiction.” She describes spending in much the same way an alcoholic would describe vodka or a heroin addict would describe smack. I was actually really surprised to read about some of the big financial mistakes she made. Lauren Greutman and I are in several of the same groups on Facebook, mainly for Financial Media. And while there are many other writers in our groups who have debt, Lauren has always seemed to have her stuff together. Of course, that’s easy for me to armchair-quarterback from the benefit of my age (let’s say the other side of 40) when it was her 25-year-old self that I was reading about. I wasn’t great with money when I was 25, either. By the end of the first chapter, I was making a list of all the people in my life who NEED to read this book. As you know, we’re winding down a home remodel, and I have a lot of things demanding my time, but I found myself looking for ways to read a chapter here and a chapter there. I couldn’t put this book down, it spoke to me in such a strong way. Lauren tells her story with such ease. I think the reason her story is so compelling is because I know someone exactly like her. Actually, I know a lot of 25-year-old Laurens. Lauren says later in the book that she finally figured out that something other than money was more important than spending. (No spoilers here.) But she had to get to that point, before she could fix her situation. You won’t make any changes, until you are ready to make changes. Period. This applies to so many different things in life. Addiction for sure. Money problems in general. Heck, p-r-o-b-l-e-m-s in general. Want to lose weight? When the pain of being fat is greater than the pain of making a change in your eating habits, then you will make the changes needed to lose weight. Want a cleaner house? When the pain of living in clutter is greater than the pain of changing your habits, then you will make the changes needed to get rid of the mess. The first portion of The Recovering Spender is Lauren’s story of how she accumulated her debt. Her painfully honest story should resonate with others in similar positions. In fact, it might actually be helpful to read about someone who made the same or similar money mistakes. She spent freely, knowing she didn’t have the money to cover the bills. She hid purchases from her husband, and lied about how much she spent. The second portion of The Recovering Spender is similar to the 12-step program in Alcoholic’s Anonymous – and with good reason. Alcoholism is an addiction, and so is overspending. In many ways, overspending may be harder to conquer because you are constantly bombarded with advertisements for this or that on TV, in newspapers and magazines, online, and even as you drive down the road. The urge to spend is every bit as strong as the urge to drink, but you don’t need to drink alcohol. You can live your life just fine without ever drinking another drop. But you still have to spend money. You need groceries and clothing. Your children need shoes, toys and books. You have to pay your mortgage, utility bills and medical expenses. Money has to leave your pockets frequently. Lauren walks you through each of her 12 steps to spender-recovery in the second half of the book. She provides worksheets at the very end to help you get started, as well. But the most powerful part of the book is Chapter 26, The Credit Card Experiment. Lauren went through the pain of getting out of debt, and the book details her journey over the last 10 years or so, coming to terms with her spending addiction, figuring it out, and paying off more than $40,000. So she tested herself with a credit card. One of those spend-$3,000-in-three-months to get travel rewards points credit cards. Her goal was to get some free travel for her family. She spent the $3,000 in three months to qualify, and paid it off so she didn’t have finance charges. But she also discovered that she spent an additional $2,000 that she couldn’t really account for. When the pain of staying in debt is greater than the pain of changing your spending habits, read this book. 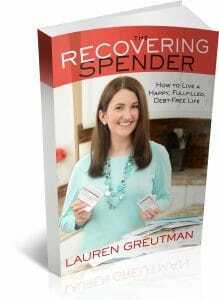 When you’re willing to do the hard work it will take to get out of debt, make one last purchase, and buy The Recovering Spender, by Lauren Greutman. Nice book review, Mrs 1500. Spending certainly sounds like an addiction and that Laurie’s story can help many folks right the ship. From the perspective of a saver sitting on the outside looking in, it is a hard to relate to some of those struggles. It seemed like toward the end she had really built up some self-control so I was surprised to hear $2,000 still went un-accounted for. I’m sure her tips for staying within her fence are key. You know, just like a non-alcoholic would find it difficult to understand how an alcoholic couldn’t just stop, I can imagine that a saver would also find it difficult to understand why she fell back into it so easily. As I read her book, I started to recognize my own issues with buying things I don’t need. At garage sales and thrift stores. “I can do something with that.” is my mantra. I have avoided them the past couple of years, because I am actively fighting my hoarding tendencies. I’ve been really good about it, too. Thanks for the book review, Mrs. 1500! I always find it helpful when bloggers I trust write reviews because there are so many finance books out there that it is hard to tell what is worth reading and what is not. Sounds like this is an interesting one to add to the “to read” list! Matt @ Optimize Your Life recently posted…You Need to Be Investing! Thanks, Matt! I definitely recommend it. You may not get as much out of it as I did, but I’m sure you’ll start naming people in your life who need to read it. I know quite a few people that would benefit from this book. But I worry they wouldn’t be too happy with the unsolicited gift 🙁 There needs to be a book on how to confront a big spender. Thanks so much for the great review of my book! I am so thrilled that you enjoyed it! It’s funny how you said that I appeared like I always had it all together….that is why I wanted to write this book so badly, because so many people appear like they do. I do think this attitude comes from our culture’s normalization of debt. I grew up thinking debt was something that you always had; it was just paid after you died from proceeds of your life insurance. Silly, I know! Like anything worthwhile, getting out of debt and staying out of debt takes a lot of hard work. There aren’t really any shortcuts. It’s about kicking the excuses to the curb and ACTUALLY doing things to cut out spendy habits. Mrs. Picky Pincher recently posted…What a (Sort of) Frugal Weekend! Readers really won’t get anything out of this book until they decide that they want to make the change and accept that they have to do the hard work. But once they’re ready, this is a great guide. Great book report Mrs. 1500. I’m so glad you mentioned spending and drinking and alcoholism. I’ve been blog ranting about those 3 for what seems like *forever*. They’re a huge source of financial pain for many. Unfortunately our culture seems to think drinking is normal, just like having debt. It doesn’t have to be that way, but having the personal strength to make true changes in life is hard. Having the personal strength to make true changes in life is hard. This is so so true. YES! Those who reach financial independence are those who put in the work. For the most part, effort will bear results (whether the results are huge or not). If it doesn’t yield results, changing the effort to create results will make that happen. Getting addicted to spending I think is the deadliest non-drug problem that a person can have. It always spirals out of control and it’s hard to reverse it. Nowadays, it’s getting so easy to pay with the plastic and paying softwares but have to practice self-control. Businesses are getting so smart about how to get their consumer’s cash! This phrase being key to your assessment: “A person can live without drugs or alchool; with tech addiction, digital temptations are everywhere”. Replace “tech” with “spending” and there’s a virtually perfect overlap. Thanks for the nice review Mrs. 1500! I do think the spending as an addiction idea is interesting and I think I’ve seen it in a few women I have known. For me, debt has never been much of an issue, just mortgage debt. I saw this was an Amazon best seller today, so it must ring true for many folks! Jon @ Be Net Worthy recently posted…Is America’s Got Talent’s $1,000,000 Grand Prize a Scam? I couldn’t agree more that spending is an addiction. I see it far too often with many of my co-workers and other acquaintances. Some people literally will buy things they don’t even know if they really want, just because spending the money makes them feel good somehow. I may have to lend some of these people a copy of this book so hopefully they can figure out how to overcome their addiction. Great book report thank you!